Need a Personal Trainer for Your Skin? We are a culture that values beauty, and the appearance of our skin deeply influences how we feel about ourselves and how others perceive us. We spend billions on skin-care products, yet we often overlook some of the basics essential to having healthy, beautiful skin. Oliver Courtin-Clarins, M.D., wants help change that. Recognized as a “skin guru,” Dr. Courtin-Clarins is the managing director of the world-renowned Clarins cosmetics empire and has researched skin care for decades. And yes, good skin-care products are important, but Dr. Courtin-Clarins reminds us of other simple, yet vital, steps we need to take to have healthy, vibrant skin. Now, The Courtin Concept becomes a personal trainer for your skin, artfully reminding you of the six keys to beautiful skin at any age. Are you aware that what you put in your grocery cart plays a major role in the apperance of your skin? Do you know all the rules about taking care of your skin in the sun? Do you know the guidelines for skin care at all ages? Learn answers to these questions and more in The Courtin Concept. The Courtin Concept is a tie in to a new line of personalized skin-care products, My Blend, designed by Dr. Courtin. The new line is being launched in select department stores in the U.S. this fall. 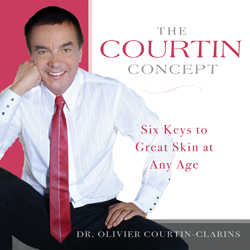 Dr. Courtin is Managing Director of Clarins, the leading maker of skin-care products in Europe.